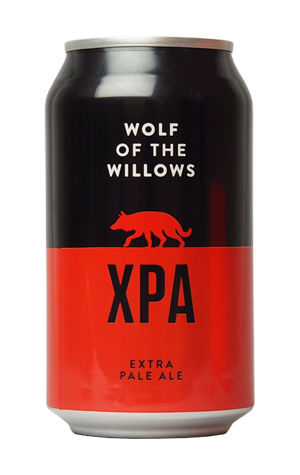 Melbourne's Wolf of the Willows was one of the first Australian breweries to release an XPA. Indeed, they launched with the XPA, explaining that for them the style meant: "extra pale in colour with extra hop aroma and flavour". It went on to take top spot in an XPA/session IPA Getting Blind With Crafty tasting soon afterwards too. Since then, as you may well have noticed, plenty of other brewers have released XPAs, some similar in conception, others with different interpretations as to what the letters should stand for; indeed, by the end of summer there will probably be as many XPAs on the local market as NEIPAs. Anyway, you may have also noticed that cans are getting rather popular, and Scott and Renae at Wolf of the Willows have decided to join in the fun in time for summer, putting their flagship beer into bold red and black cans. What's inside is the same combination of tropical and citrusy hops, balanced by biscuity malts and delivered with a tight bitterness, that fans of the beer have come to know and love. It's just more suited to the beach, barbie and music festival now.